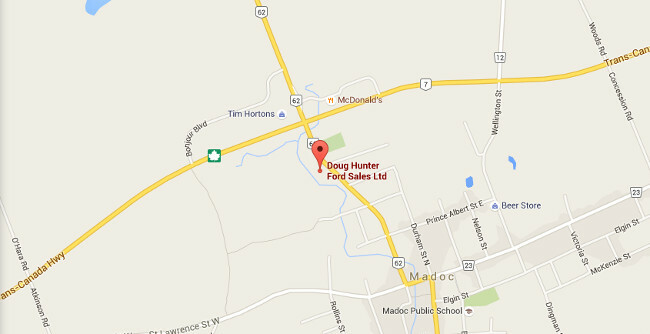 About Hunter Ford Sales - Madoc, ON Area New & Used Ford Dealership serving Madoc . Hunter Ford Sales offers many automotive products and services to our Madoc area customers. From quality new Ford vehicles to used cars, we know anyone looking for a vehicle near Madoc will likely find what they want at our dealership. We carry a comprehensive line of Ford vehicles, including the F-150, Edge, Super Duty, Escape, Fusion and Mustang making us a good choice as your Madoc Ford car dealer. Call Hunter Ford Sales or come visit us in person. We're convenient to Madoc, ON and located at 240 Russell Street. We look forward to helping you with your automotive needs. Stop by Hunter Ford Sales for all your Ford service needs. Questions? Any of our knowledgeable service and sales people can help. Call 877-704-3572.